Place raisins in a small amount of water, so they plump up a little. (this step is optional) Grate carrots on a smallest part of your grater. 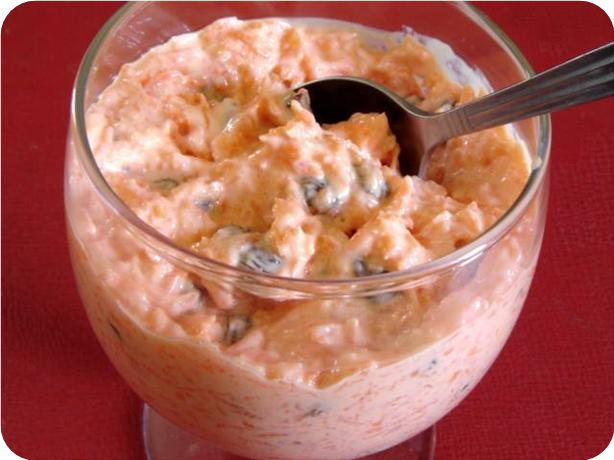 Combine grated carrots, sour cream, raisins (take them out of water prior) and then add sugar (adjust to your taste). We love it just the way it is and my l'il one gets his nutrition. Beware, this combination may make your kids grow few inches taller. Carotene with sour cream and sugar is a dangerous mix for your kid's growth potential.